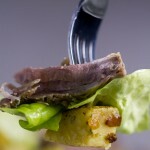 Classic veal (under) shoulder roast with onion potatoes. What we have here is the succulent, falling-off-the-bone meat, paired perfectly with potatoes that were first boiled, then simmered over onion for a seamless soft+crunch combo. 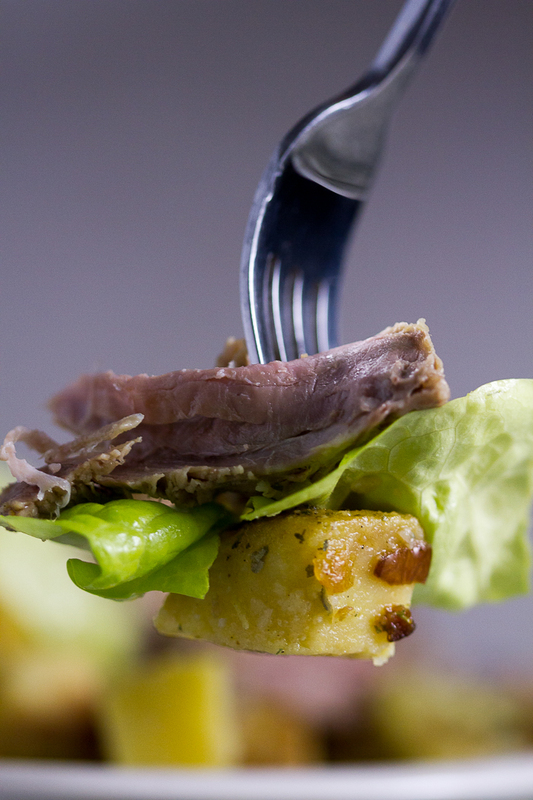 I’ve covered veal roast on Balkanvibe before, and now it’s time to share it with you. 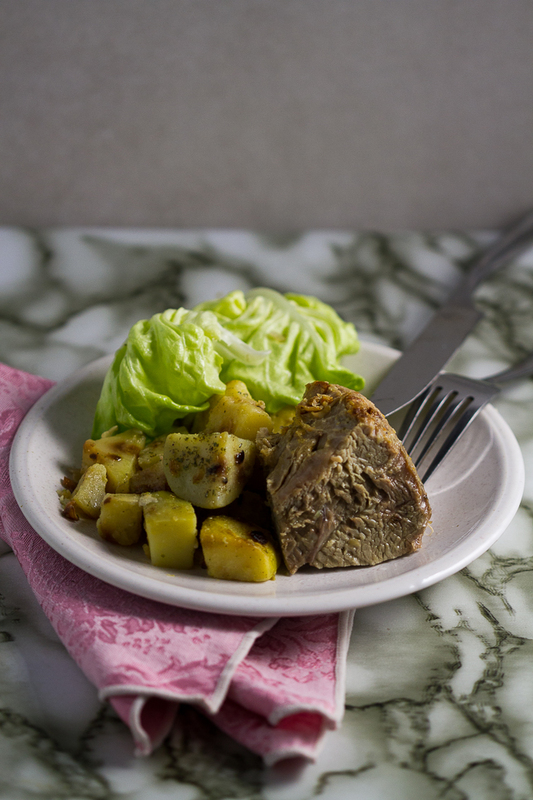 When you order veal roast at local restaurants, today’s recipe is exactly what you get (with a side of potatoes and a salad). When you learn to do the veal roast right (and you can do this quickly with today’s easy instructions), you can consider yourself accomplished in the kitchen. This is a perfect example of a classic, and at the same time undemanding recipe, that’ll take your cooking resume a long way. The immediate result is the most moist, soft roasted meat. It falls of the fork. It’s chewy in the right way, tender in the right way, even tough in the right way. Veal roast is the kind of meat you can pair with anything: rice, polenta, or mashed potatoes. For an even better taste, leave meat in the fridge overnight and serve cold (with a little bit salt on top) the following day. I promise you, it’s the best breakfast (or lunch) you’ll have. Just grab a slice of bread and munch on veal just like that. Bonus tip: cut up a tomato and munch on that too. Alternatively, you can make a salad or a sandwich with it. I L O V E I T! Honestly, if veal roast isn’t on our table during family dinners, I have to mask my disappointment. And this roast is as basic as peanut butter and jelly. It doesn’t call for any complicated marinades or over the top cookery. Marinade is basic, simple, and perfect. It consists of mustard, spices and oil, and is finished in less than five minutes. 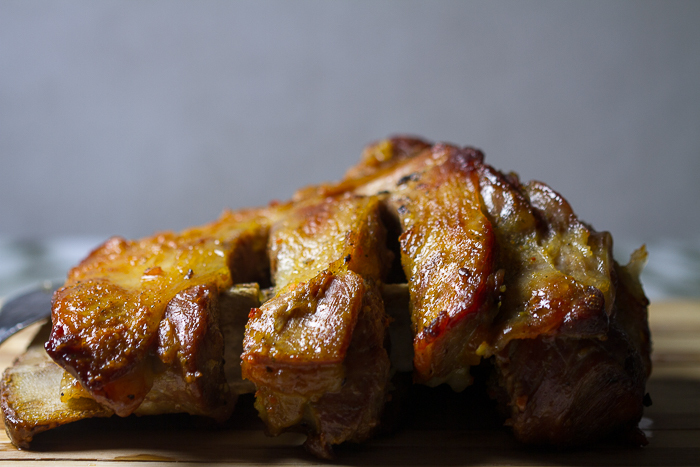 When shopping for veal, ask for under the shoulder blade (potplećka) piece starting with the first rib and ending at rib 6 or 7. While you’re at it, ask the butcher to make a few incisions a couple of inches apart on top of the meat. This helps it roast more evenly. Here’s a basic formula for roasting you can follow to get the perfect taste each time: for each kilogram of veal, roast meat for one hour. So one kg = one hour, two kg = two hours, etc. Got it? Translated to pounds this means you’ll roast the meat 1 hour for every 2 pounds (approximately). So two pounds = one hour. Easier? Although not in the meatloaf category, one of my favorites on the blog is the classic Balkan moussaka. It’s made with loads of ground beef and potatoes, layered to perfection and then baked. After baking it a while, we pull it out of the oven and pour a mixture of milk and sour cream over it. And sprinkle parsley on top. The moussaka recipe also has a video to better assist you in making it. I’m also impartial to basic Balkan meatballs called ćufte. On the smaller side, these meatballs are soft and moist and a perfect meat addition to anything you can think of: pasta, mashed potatoes, rice, sandwiches even. I guarantee these are better than the tasty meatballs from Subway. Finally, when I’m craving a bigger chunk of meat to bite into, I often turn to the drunken schnitzels: breaded veal cutlets baked in wine. Perfect over rice. You can make any side you want to with these also. But rice so perfectly soaks up the juices from the schnitzel boozy sauce it’s become my only side for these. Fast and quick breading helps keep all the veal flavors in the schnitzels. Then the broth and red wine infuse it with additional flavor during baking. And voila, in two relatively easy steps, these become the best cutlets you’ll make all year long. Or ever! Marinate meat the night before by mixing marinade ingredients, then brushing the meat with the marinade generously on all sides. Keep meat in fridge overnight. The following day, oil a roasting pan on all sides, and transfer the meat inside it. Cover the pan first with a large piece of foil, and pierce it a few times with a toothpick, or fork, on top. Finally, cover the pan with lid over foil. Heat oven to 480°F (250°C). Place the pan on the middle rack and roast for 20-30 minutes. Lower temperature to 390°F (200°C), and roast another 60-70 minutes. Take the pan out carefully, and remove lid and foil. Flip the meat around. Return to oven for another 20-30 minutes, uncovered. Meanwhile, start on onion potatoes. Fill a large pot with water and add potatoes. Bring to boil on high. Lower temperature to medium and boil another 20-30 minutes, or until the potatoes are soft but not falling apart (check with fork). 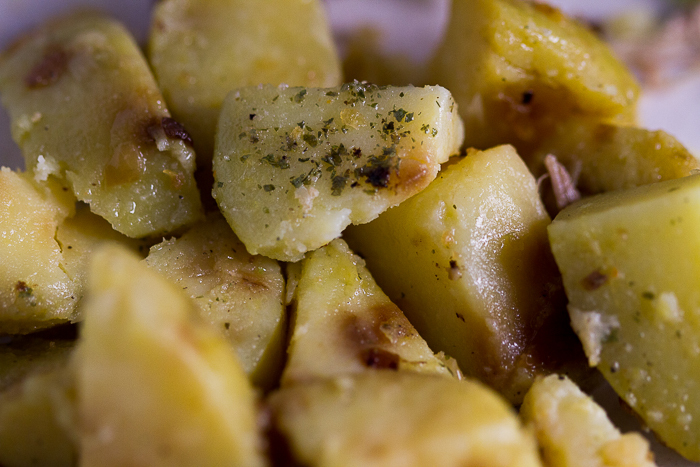 Take out, strain, and peel potatoes under cold water. Dice into larger chunks. Heat oil in a large pan. Add onion and simmer on medium until it crystalizes. Add potatoes and simmer on low to medium for another 20-30 minutes, frequently stirring. Remove off heat. Process is the same for veal shoulder, however under veal shoulder is best for this kind of roast. Ask the butcher to give you the under the shoulder piece from rib 1-6, and to make a few incisions on top of the meat. Roast the meat 1 hour for each 2 pounds. If you have a 4 pound piece of meat, roast it approximately 2 hours. Remember the meat needs to be marinated the night before. Leave meat leftovers in fridge. Veal is even better the next day, cold, with a little bit of salt on top. 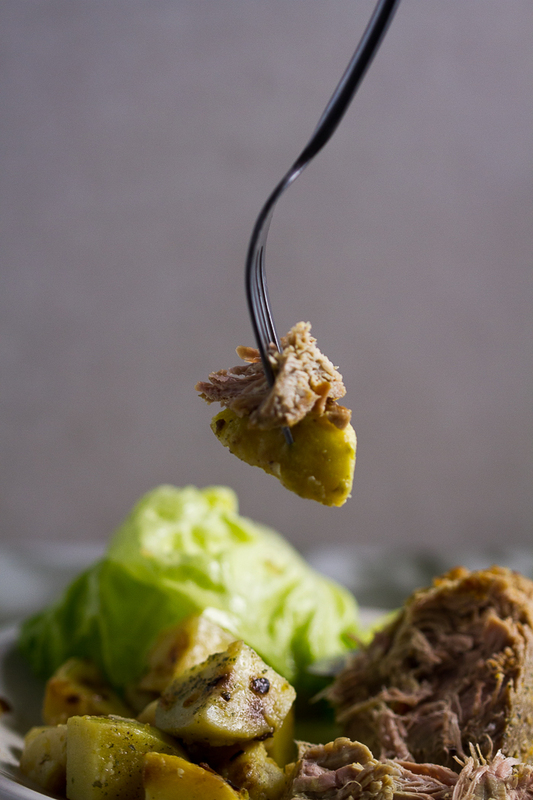 Paleo: make a different side dish instead of potatoes. Use olive oil, lard or butter instead of sunflower oil. So as you may remember, I live in southern California where buying veal is close to impossible, but…I finally found The Butchery in Newport Beach (like 20 miles from me) and I can order the exact cut as you describe, yay!! – I am sure it will cost a fortune but I am dying to try this so I’m going to go for it. My mother in law used to make this but I think she just tossed potatoes in the roasting pan with the meat, does that sound famiilar? Do you know if the potatoes will work or if there is something I need to do differently? Thanks!! – I’m doing this today – roast has been marinating since last night. I’ll let you know.